The House Beautiful reader is someone whose home is her bedrock. She is always improving it because the process &ndash; and result &ndash; delights her. Happiness in her home comes from easy luxury and highly personal style. Her home is a gift to share with family and friends. The Best: The editors' inside-view of today's hottest products. Color: The perfect color every time! Top designers share their colorful secrets for effectively using color. The Makeover: Monthly series following the progress of an ongoing renovation project. Tablescape: Expert advice on setting a luxurious table--or creating a tabletop vignette--in your own home. Ask the Barefoot Contessa: Ina Garten shares simple how-tos, recipes, and entertaining tips. Cookbook: Editors put the latest cookbooks to the test, making recipes and offering real advice on what works--and what doesn't. Features: House Beautiful is the home design magazine that puts the reader and her lifestyle, tastes and dreams first. Recent issues have showcased furniture, accessories for the home, the use of color in your rooms, and how to make the most of a small space. 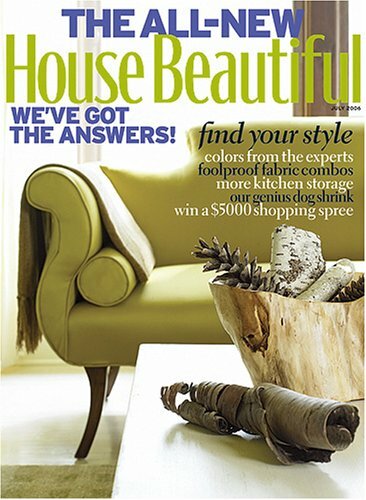 House Beautiful is a larger-than-average magazine printed on rich, glossy paper that makes the photography inside jump off the pages. It is a highly visual magazine featuring homes that are approachable and eclectic. Editor-in-chief: Stephen Drucker, since October 2005. Prior to that he was a contributing editor at Architectural Digest and Martha Stewart Living. Editors at large include Mary Emmerling, Senga Mortimer, and Robert Rufino. Other contributing editors include The Barefoot Contessa, Ina Garten, and Frances Schultz. House Beautiful has a clean-cut feel that celebrates a healthy indoor/outdoor lifestyle. Because it's all about the reader, House Beautiful does not endorse a particular style, region, or coast. It is an all-inclusive experience. Honors include: Interior Design Hall of Fame inductee, 1993 Circle of Excellence Award, International Furnishings & Design Association Star of Design Award and the Pacific Design Center Frank Lloyd Wright Conservancy Special Interest Award. Informative, current, well-done. One of the very few that you can actually READ and learn something from. A variety of interesting features every month. And beautifully photographed. This is a great magazine! We just moved into a new house and the decorating ideas have been so helpful! I look forward to more issues! House Beautiful has as much quality to offer the reader as many magazines that are at a higher price range; thick glossy pages, superb photography, and for those who need some inspiration for home and garden improvements, a plethora of useful design ideas. The interior: A nice "How to" page, with solutions that will fit your pocketbook, and make your home interesting; "Designer Challenge", a new series where experts tackle "problem areas"; a long article on "The Next Wave", profiling twentyfive up-and-coming designers who are "rising stars from coast to coast"; an in-depth look at 4 gorgeous homes: A sparse but elegant Edwardian house in Dallas, a plantation-style house in Georgia, a classic home in the Georgetown area of Washington, D.C., and my favorite, a minimalist, lavishly comfortable duplex in Miami, Florida. The exterior: "Art Imitating Nature", a Phoenix Arizona garden that uses native plants in a way that blends into the architecture. Food: "Fruit Under Fire", a luscious collection of recipes for grilled fruit, with close-up illustrations that are enough to stir up the appetite. I have recieved 3 issues so far. The only feedback I have is this seems to be a magazine designed for people 70+. The interior design showns very old antiques cluttered with lots of unrelated stuff. The recent issue introduced a bathroom make-up reminded me the houses built in the 60s. I perfer to see a bright, clean, and modern view of the houses. Maybe this magazine is not for me, however, I don't know how to unsubscribe it if it is bought through Amazon. Great Pics, Great Ideas, Great Magazine!! Watch out for Hearst magazine scams. When I emailed Hearst (there is no phone number for customer service) to let them know that I did not order this publication, they sent the following reply: "We have received your renewal order. When payment of [...] is received, service will continue through 12 issues." I'm not sure what part of "I did not order this magazine and do not want this magazine" they did not understand. Terrible company and it is unfortunate that they take advantage of their customers in this way. This magazine gives you good ideas and images as far as decorating and improving the value of your house. Nice pictures. I just received my first two issues yesterday. This magazine is page after page of advertisements. The thing that really bugs me about that is - companys run the same advertisements in the same magazines again and again so two issues are virtually the magazine since there are very few articles. For some reason even the articles in this magazine get lost because they have the same look as their ads. One article was suppose to be tips from over 125 top designers - what it really was - 125 designers listed with addresses and phone #s and a couple of tips on each page of that section. I'm really disappointed. For a GREAT magazine, try Southern Living. For a REALLY GOOD magazine, try Better Homes and Gardens.